What Is Quilt Binding and How Is it Made? Quilt binding is the fabric that's used to cover the outer edges of the quilt sandwich — the quilt top, batting, and backing — after the quilt is quilted. Binding keeps the edges intact and can add another element to the quilt's design. Sewing binding around a quilt's edges is one of the final steps in quiltmaking. Quilt binding can be constructed from a fabric that's already been used in the design, or with any other fabric that works with the layout. Binding can be made from a single layer of fabric, but two layers (called double-fold binding) are much more durable. Lengthwise grain binding strips have threads that tend to run fairly straight along their length, where they run parallel to the edges of the quilt. If a single thread becomes weakened and breaks, it could split the binding along one entire side of the quilt, traveling as far as the weakened thread travels. 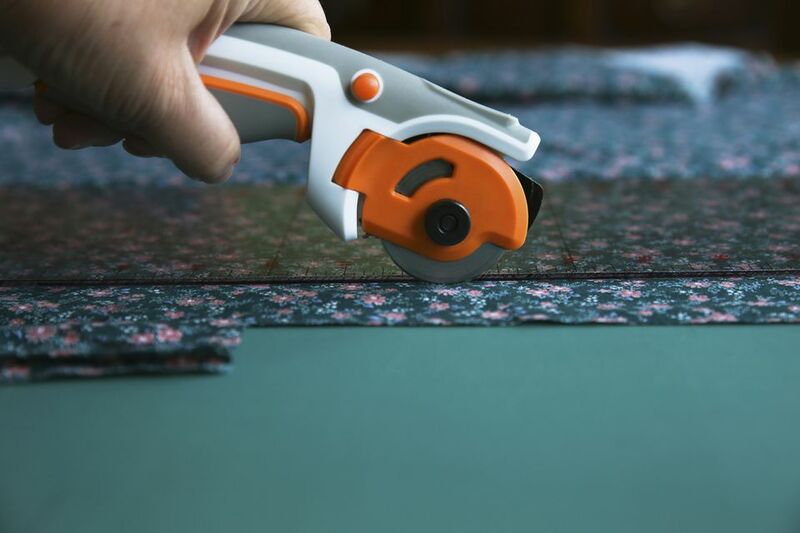 That scenario is most likely to be a problem for quilts that are used and laundered often; both actions that allow the raw edges underneath the binding to rub against the binding in an abrasive way. Crosswise grain quilt binding strips are a good choice for most quilts. Crosswise grain isn't usually perfectly straight, so there's less risk that a split would damage an entire side — it would be more likely to travel a short distance and then stop when it butts into the quilt's front or back. Crosswise grain binding strips are also stretchy enough to wind around large curves on a quilt's exterior. The grain in bias binding strips runs at an angle, so it moves at an angle from front to back after the binding is sewn to the quilt. A split would affect a fairly small area of the quilt's edge, giving you more time to make repairs. Learn how to make continuous bias binding strips from a simple tube of fabric. Bias binding is somewhat stretchy, making it a good choice for quilts with tight curves and deep angles on their perimeter. Consider choosing your binding fabric after a quilt top is assembled, because it's difficult to preview how a fabric will look until everything else is in place. Place your blocks or finished quilt top on a design wall or another flat surface and tack strips of potential binding fabrics alongside. Step away. Do you like the look? Leave the room for awhile and come back. Do you still like the quilt's appearance? Preview more fabrics until you're satisfied with the binding choice. If the quilt doesn't have borders, a binding sewn to edges with a 1/4" seam is the best choice, since that width matches the 1/4" seam allowance that's built-in to the edge of most quilt blocks. Sewing with a wider seam will chop off important design elements. If the quilt has borders, it's just as simple to use a binding that's wider or narrower than 1/4", since it doesn't make too much difference how far inward the seam to attach binding is sewn. Single fold binding is made with a single layer of fabric that folds over the outer edge of a quilt. Reserve it for miniatures or wall hangings — single fold binding is not durable enough for quilts that will be used on a bed. Sometimes called French binding, double fold binding is made by folding a long strip of fabric lengthwise to create two layers. The extra layer offers protection from wear. It's the top binding choice of most quilters. Add a bit of extra insurance width to the formula. The extra width might make the binding extend a bit farther onto the quilt back when it's time to stitch it in place, but that's a much better scenario than not having quite enough to cover the seam used to secure it to the quilt sandwich. Avoid most bindings that are sold as notions in fabric stores, because they aren't durable enough to use in a quilt. Moda is one fabric manufacturer that sells bias binding by the yard. It's made from the same quality fabrics they produce on the bolt. Your binding doesn't have to be made from one fabric. Assemble binding with as many different fabrics as you like to create a scrappy appearance. Cut long crosswise grain strips from wide backing fabric to reduce the number of seams or eliminate seams entirely. Extra binding width is very helpful when you use a high loft batting. Measure your quilt along its top and along one side. Add the two lengths together and multiply that figure by two. Add 20" or so to the total to determine how much binding you'll need to surround the quilt if you plan to use continuous strips and miter the corners. Using the strip width determined earlier, ​cut strips from selvage to selvage until you've cut enough fabric to surpass the required length. Don't join strips with straight seams across their ends, because that method creates a binding with seam allowances that travel from the front of the quilt to the back in a straight line, resulting in too much bulk in one spot. Use the following method to assemble a binding strip with diagonal seam allowances that are distributed along the length of the finished binding. Place two fabric strips right sides together, perpendicular to each other as shown, top left. Strip ends will overlap. Secure with a straight pin. Mark the top strip on the diagonal, beginning and ending the line at the inward corner where the two strips intersect. Sew strips together on the marked line, middle illustration. Trim away the excess fabric, leaving about a 1/4" seam allowance to the right of the seam line. Press the seam allowance open. Trim off the little triangular nubs that are at the ends of the seam allowance — they extend past the sides of the strip. Join more strips until you have assembled the binding length required for your quilt. Press the strip. Fold it in half lengthwise and press again if you are making a double fold strip.